We are London’s leading Air Conditioning Company with over 30 years continual trading. Our engineers operate throughout London and the Home Counties. We provide unbeatable prices coupled with the highest quality service to all our clients. We specialise in installations, repairs and maintenance of fitted air conditioning systems and the sale/hire of portable air conditioning units. We are also the only aircon company offering an unrivalled 10-year warranty on every one of our installations. We work on both large and small air conditioning installations all over the capital. We offer a free site survey to all our customers to make sure you get exactly what you need. All of our engineers are all fully qualified, experienced, and treat your property with the utmost care and attention. We are London’s only air conditioning showroom where you can see every style of air conditioner in action. This is a useful opportunity to see the units ‘in the flesh’ as well as being able to meet our dedicated support and service team (tea, coffee, and biscuits are always on the menu!). We have expert air conditioning maintenance and repair engineers working throughout Greater London and the Home Counties. Our dedicated service and repair teams know that speed is of the essence when your air conditioner is not working. We ensure your units are diagnosed and repaired in double-quick time! We also offer a comprehensive planned maintenance service which is why so many of the United Kingdom’s largest companies rely on us to service and maintain their air conditioning systems (see our client list). The Air Conditioning Company can offer you many suggestions as to how to achieve substantial savings in running costs and to help avoid unnecessary repairs and breakdowns. There are many factors to take into consideration when deciding which air conditioning system is right for your application. Of paramount importance is to ensure that the unit(s) are ‘man enough’ to sufficiently cool/heat your room. So often we see competitors quotations based upon the supply of units that are obviously underpowered for the job. We offer a free site survey on all potential installations. Our expert surveyors will talk you through all available options and show you brochures of units to make sure that you are happy with the aesthetics (and remember you are always welcome to visit our huge London showroom). Before we arrange your survey, our sales team will give you a very accurate estimate over the phone. Call our friendly expert team now or click on the links below to find out more about our services. We Don’t Promise... We’re Proven! The Air Conditioning Company is proud to be in its fourth decade of providing unrivalled expertise, unbeatable prices, and service with the hugest of smiles. Of course we blow our own trumpet, but getting independent opinions is always better! Why not check out our ever increasing list of happy customers on Trustpilot. Don’t assume that we’re expensive because you can see many ‘big names’ on our Client List. We win these large and often very small contracts for the precise reason that we are very competitive. The Air Conditioning Company was formed in 1986 after CEO Jeff Salmon had discovered the popularity of portable air conditioners in Asia. Mobile units had never been seen in the UK, and Jeff took a gamble on the infamous ‘British summer’ and ordered the best quality units he could find. The gamble paid off, and the units became hugely popular all over the UK. We have continued to grow year on year, and now we have teams of air conditioning engineers who install and repair fitted systems all over Greater London and the Home Counties. Our ethos since 1986 has been (and always will be!) only to sell the highest possible quality at the keenest prices coupled with unbeatable customer care. 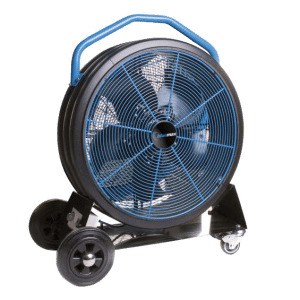 The Air Conditioning Company provides a broad range of portable air conditioning units, evaporative air coolers, and industrial fans. We stock units that are ideal for industrial, commercial and domestic environments. We offer large and small portable air con units which you can hire or buy with same day delivery in London and free next day delivery nationwide.